Placer gold is free gold particles found in gravel beds formed by water draining off hillsides, collecting in the valley bottom, and then running down the valley as a stream. Over time the material from the hillsides breaks down, and makes its way to the valley floor; this material is subject to the action of the stream flow, where it is ground up and sorted by gravity and water. Lighter gravel is carried downstream, while heavier minerals and gold particles are left behind, trapped in cracks and depressions in the bedrock on the floor of the streambed. This sorting process is carried out over a long geological time period, so that in some instances the gold deposits can be very rich. Place gold particles can range in size from talcum powderlike fine dust to nuggets of the size of golf balls or larger. The placer gold in the Fortymile gravels is generally fine grained; most of the gold particles will pass through a 20 mesh sieve. Approximately 5% of the gold particles are coarser than 10 mesh. Occasional pockets of coarse gold ranging up to 3 to 4 mesh are found in bedrock reefs, particularly where feeder creeks enter the mainstem of the river. Rarely, large nuggets are found in the river gravels. The creeks emptying into the Fortymile River generally have courser gold, with nuggets of significant size occasionally being found. The fineness of the gold in the Fortymile drainage is relatively consistent, ranging from 82% to 85% in purity, the non-gold portion being silver. High terrace gravels record a time from the late Tertiary to the late Pleistocene when the river had flood plains from 1 to 2 miles wide and had shallow gradients. The river subsequently incised into these auriferous flood plains and developed the youthful characteristics that it has today. The placer gold from these ancient benches reconcentrated in the present river valley. 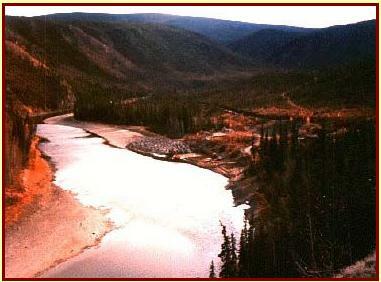 The Fortymile River drains an area of approximately 15,000 km2. The present river valley varies from 1,000 to 3,000 feet in width. The river channel, as defined by the high water marks on the banks, averages approximately 500 to 800 feet in width. Water flows from bank to bank at high water during spring break-up; over the summer months as the water volume decreases, large gravel bars are exposed in the main channel. These massive gravel bar deposits are auriferous; average depth to bedrock is approximately 15 feet. The bar gravel is thawed. Because the bars are inundated annually by high water, they are unvegetated, save for transient grasses and willows. There are a series of terraces adjacent to the river channel. These terraces or benches vary from 10 to 600 feet above the elevation of the river channel. This ground is covered with vegetation and overburden, varying in depth from 1 to 12 feet and more. Much of it is permanently frozen, although it thaws rapidly when the vegetation is stripped off. The gravel underlying the overburden contains gold in varying quantities. Generally, the gold is more concentrated just above and into the bedrock. Gravel depth varies from 6 to 30 feet. On page 65 of USGS Bulletin 2125, Yeend calculated that "Using Leon's mass balance equation, 5,167 metric tons of gold may exist in the placers of the Fortymile River region; the recovered amount of 15.6 metric tons is less than 1% of this." This analysis suggests that there is a tremendous quantity of placer gold yet to be mined on the Fortymile. This photograph show a typical example of bar and terrace mining operations. The bar on the right hand side of the river channel is being dredged. 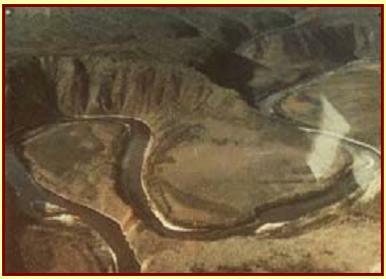 Tailings piles can be seen with the dredge pond visible in front of them. The terrace adjacent to the bar has been stripped of vegetation, preparatory to mining. This photograph shows the river channel which has incised through the terrace gravels into the valley bottom. The sinuous channel is indicative of a young river. 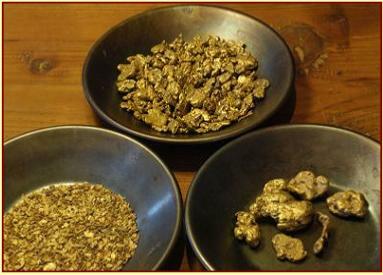 These pans of gold show the range of sizes in which placer gold particles are found. Because gold is mailable, the action of the water and gravel over time on the gold particles has rounded them.